I finished the applique and machine embroidered music bag I have been making for my daughter. I didn't want to faff about attaching the lining inside out and then turning it, so I just nestled the lining inside and bound round the top as if I was machine binding a quilt. Then I made plaited handles so they were a bit robust, and sewed buttons on to cover the fixing stitches. As a friend pointed out there's a lot of cream in there so I thought I'd better photograph it before it begins its working life this afternoon! that little birdie is genius! Certainly more chic than one of those brown leather cases (do they still make those?) Your musician will love it I am sure. It is really lovely Catherine, your daughter will have the smartest music bag around! How darling! Very artistic. And I like your idea of how to add a lining and attach as you sew on the binding. I'm making Christmas stockings today, and have been fretting over that whole issue. Thanks for the tip. 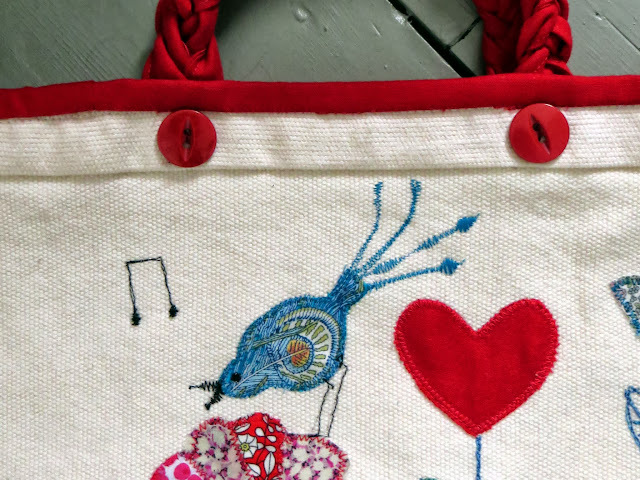 Beautiful embroidery, your musical daughter will be the envy of her music class with such a lovely bag to carry her music sheets in, bravo. Absolutely gorgeous! Miss PatchyRose would like one, are you taking orders?!? So whimsical and lovely! Inspired! It is wonderful and joyfull! Fantastic! So clever and lovely! What a lucky girl! it is a good idea to cover the handle stitches with buttons, very neat! And the birdies are gorgeous. A sweet charming bag in every way! So sweet and beautiful. I love the birdies with the music notes. Your daughter must be so thrilled with her new bag. Absolutely a wonderful bag. I love the finishing with red on top and the handles. And of course the embroidery - so delightful. And thank you, Catherine, for commenting in my latest post about the wrought iron gate. It is because of this gate which is really very long - about 40 m - and rusted! rusted! - that we call this house our villa.